Mia Ridge, Christian Algar, and Alex Mendes, ‘Introducing… Playbills In the Spotlight – Digital Scholarship Blog’, British Library Digital Scholarship Blog (blog), September 2017, http://blogs.bl.uk/digital-scholarship/2017/09/introducing-playbills-in-the-spotlight.html. Mia Ridge, Christian Algar, and Alex Mendes, ‘You’re Invited to Come and Play – In the Spotlight’, British Library Digital Scholarship Blog (blog), November 2017, http://blogs.bl.uk/digital-scholarship/2017/11/youre-invited-to-come-and-play-in-the-spotlight.html. Mia Ridge and Christian Algar, ‘Press Release: British Library Crowdsourcing Project to Unlock a Treasure Trove of 18th and 19th Century Theatre Playbills’, The British Library Press Office, 10 November 2017, https://www.bl.uk/press-releases/2017/november/playbills-crowdsourcing-website-launch. Thomas Evans and Mia Ridge, ‘Re-Imagining a Catalogue of Illuminated Manuscripts – from Search to Browse’, British Library Digital Scholarship Blog (blog), 16 December 2016, http://blogs.bl.uk/digital-scholarship/2016/12/re-imagining-a-catalogue-of-illuminated-manuscripts.html. ‘If you follow @BL_DigiSchol or #DigitalHumanities hashtags on twitter, you might have seen a burst of data science, history and digital humanities jobs being advertised. In this post, Dr Mia Ridge of the Library’s Digital Scholarship team provides some background to contextualise the jobs advertised with the ‘Living with Machines’ project. We are seeking to appoint several new roles who will collaborate on an exciting new project developed by the British Library and The Alan Turing Institute, the national centre for data science and artificial intelligence. You may have noticed that the British Library is also currently advertising for a Curator, Newspaper Data (closes Sept 9). This isn’t related to Living with Machines, but with an approach of applying data-driven journalism and visualisation techniques to historical collections, it should have some lovely synergies and opportunities to share work in progress with the project team. There’s also a Research Software Engineer advertised that will work closely with many of the same British Library teams. 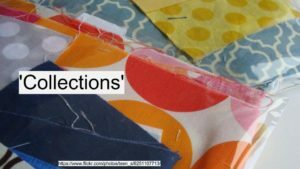 From piles of material to patchwork: How do we embed the production of usable collections data into library work? 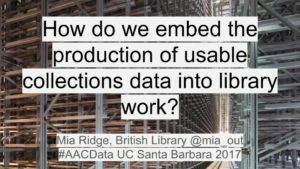 These notes were prepared for a panel discussion at the ‘Always Already Computational: Collections as Data‘ (#AACdata) workshop, held in Santa Barbara in March 2017. While my latest thinking on the gap between the scale of collections and the quality of data about them is informed by my role in the Digital Scholarship team at the British Library, I’ve also drawn on work with catalogues and open cultural data at Melbourne Museum, the Museum of London, the Science Museum and various fellowships. My thanks to the organisers and the Institute of Museum and Library Services for the opportunity to attend. My position paper was called ‘From libraries as patchwork to datasets as assemblages?‘ but in hindsight, piles and patchwork of material seemed a better analogy. The invitation to this panel asked us to share our experience and perspective on various themes. I’m focusing on the challenges in making collections available as data, based on years of working towards open cultural data from within various museums and libraries. 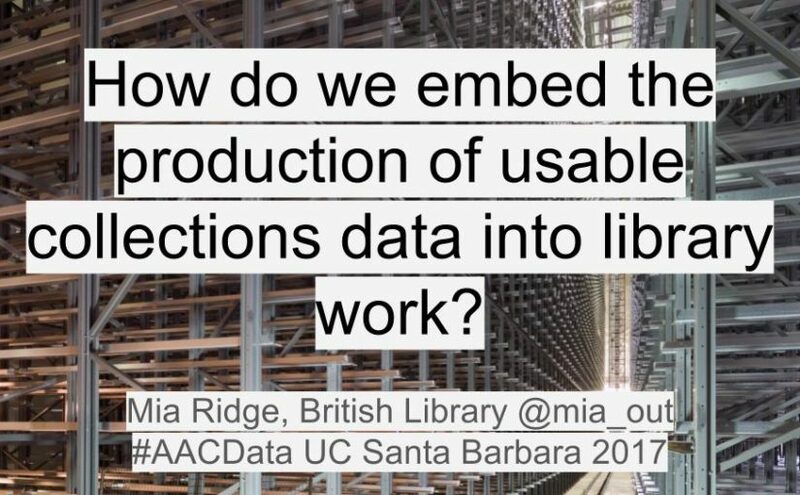 I’ve condensed my thoughts about the challenges down into the question on the slide: How do we embed the production of usable collections data into library work? It has to be usable, because if it’s not then why are we doing it? It has to be embedded because data in one-off projects gets isolated and stale. ‘Production’ is there because infrastructure and workflow is unsexy but necessary for access to the material that makes digital scholarship possible. 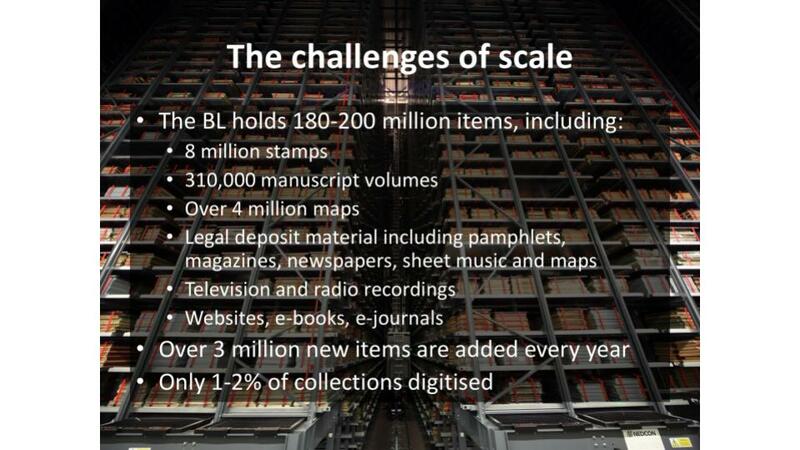 One of the biggest issues the British Library (BL) faces is scale. The BL’s collections are vast – maybe 200 million items – and extremely varied. My experience shows that publishing datasets (or sharing them with aggregators) exposes the shortcomings of past cataloguing practices, making the size of the backlog all too apparent. Good collections data (or metadata, depending on how you look at it) is necessary to avoid the overwhelmed, jumble sale feeling of using a huge aggregator like Europeana, Trove, or the DPLA, where you feel there’s treasure within reach, if only you could find it. Publishing collections online often increases the number of enquiries about them – how can institution deal with enquiries at scale when they already have a cataloguing backlog? Computational methods like entity identification and extraction could complement the ‘gold standard’ cataloguing already in progress. If they’re made widely available, these other methods might help bridge the resourcing gaps that mean it’s easier to find items from richer institutions and countries than from poorer ones. You probably already all know this, but it’s worth remembering: our collections aren’t even (yet) a patchwork of materials. The collections we hold, and the subset we can digitise and make available for re-use are only a tiny proportion of what once existed. Each piece was once part of something bigger, and what we have now has been shaped by cumulative practical and intellectual decisions made over decades or centuries. Digitisation projects range from tiny specialist databases to huge commercial genealogy deals, while some areas of the collections don’t yet have digital catalogue records. Some items can’t be digitised because they’re too big, small or fragile for scanning or photography; others can’t be shared because of copyright, data protection or cultural sensitivities. We need to be careful in how we label datasets so that the absences are evident. In addition to the incompleteness or fuzziness of catalogue data, when collections appear as data, it’s often as great big lumps of things. It’s hard for normal scholars to process (or just unzip) 4gb of data. Currently, datasets are often created outside normal processes, and over time they become ‘stale’ as they’re not updated when source collections records change. And when they manage to unzip them, the records rely on internal references – name authorities for people, places, etc – that can only be seen as strings rather than things until extra work is undertaken. 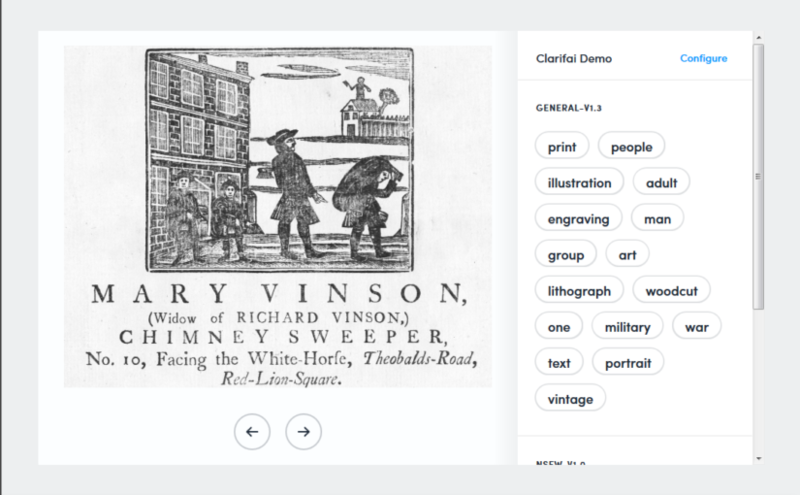 The BL’s metadata team have experimented with ‘researcher format’ CSV exports around specific themes (eg an exhibition), and CSV is undoubtedly the most accessible format – but what we really need is the ability for people to create their own queries across catalogues, and create their own datasets from the results. (And by queries I don’t mean SPARQL but rather faceted browsing or structured search forms). Collections are huge (and resources relatively small) so we need to supplement manual cataloguing with other methods. Sometimes the work of crafting links from catalogues to external authorities and identifiers will be a machine job, with pieces sewn together at industrial speed via entity recognition tools that can pull categories out or text and images. Sometimes it’s operated by a technologist who runs records through OpenRefine to find links to name authorities or Wikidata records. Sometimes it’s a labour of scholarly love, with links painstakingly researched, hand-tacked together to make sure they fit before they’re finally recorded in a bespoke database. This linking work often happens outside the institution, so how can we ingest and re-use it appropriately? And if we’re to take advantage of computational methods and external enhancements, then we need ways to signal which categories were applied by catalogues, which by software, by external groups, etc. The workflow and interface adjustments required would be significant, but even more challenging would be the internal conversations and changes required before a consensus on the best way to combine the work of cataloguers and computers could emerge. The trick is to move from a collection of pieces to pieces of a collection. Every collection item was created in and about places, and produced by and about people. They have creative, cultural, scientific and intellectual properties. There’s a web of connections from each item that should be represented when they appear in datasets. These connections help make datasets more usable, turning strings of text into references to things and concepts to aid discoverability and the application of computational methods by scholars. This enables structured search across datasets – potentially linking an oral history interview with a scientist in the BL sound archive, their scientific publications in journals, annotated transcriptions of their field notebooks from a crowdsourcing project, and published biography in the legal deposit library. A lot of this work has been done as authority files like AAT, ULAN etc are applied in cataloguing, so our attention should turn to turning local references into URIs and making the most of that investment. Applying identifiers is hard – it takes expert care to disambiguate personal names, places, concepts, even with all the hinting that context-aware systems might be able to provide as machine learning etc techniques get better. Catalogues can’t easily record possible attributions, and there’s understandable reluctance to publish an imperfect record, so progress on the backlog is slow. If we’re not to be held back by the need for records to be perfectly complete before they’re published, then we need to design systems capable of capturing the ambiguity, fuzziness and inherent messiness of historical collections and allowing qualified descriptors for possible links to people, places etc. Then we need to explain the difference to users, so that they don’t overly rely on our descriptions, making assumptions about the presence or absence of information when it’s not appropriate. 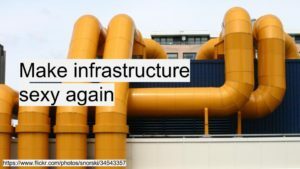 A lot of what we need relies on more responsive infrastructure for workflows and cataloguing systems. For example, the BL’s systems are designed around the ‘deliverable unit’ – the printed or bound volume, the archive box – because for centuries the reading room was where you accessed items. We now need infrastructure that makes items addressable at the manuscript, page and image level in order to make the most of the annotations and links created to shared identifiers. My final thought – we can start small and iterate, which is just as well, because we need to work on understanding what users of collections data need and how they want to use them. We’re making a start and there’s a lot of thoughtful work behind the scenes, but maybe a bit more investment is needed from research libraries to become as comfortable with data users as they are with the readers who pass through their physical doors. 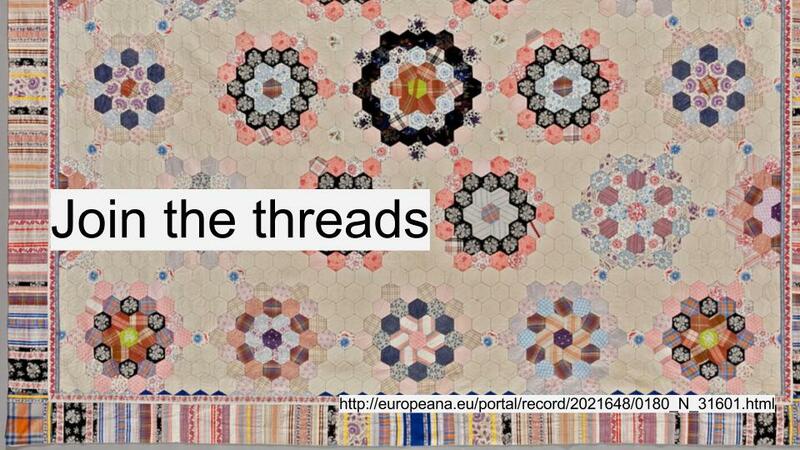 Posted on 6th March 2017 Categories Digital humanities, Linked open cultural data, Museums, libraries and archives, My conference papers, TechnologyTags collections, conference papers, cultural content, digital heritage, digital humanities, GLAM, libraries3 Comments on From piles of material to patchwork: How do we embed the production of usable collections data into library work? A quick signal boost for the collaborative notes taken at the DH2016 Expert Workshop: Beyond The Basics: What Next For Crowdsourcing? (held in Kraków, Poland, on 12 July as part of the Digital Humanities 2016 conference, abstract below). We’d emphasised the need to document the unconference-style sessions (see FAQ) so that future projects could benefit from the collective experiences of participants. Since it can be impossible to find Google Docs or past tweets, I’ve copied the session overview below. The text is a summary of key takeaways or topics discussed in each session, created in a plenary session at the end of the workshop. Plenary session, possible next steps – put information into a wiki. Based around project lifecycle, critical points? Publication in an online journal? Updateable, short-ish case studies. Could be categorised by different attributes. Flexible, allows for pace of change. Illustrate principles, various challenges. Short-term action: post introductions, project updates and new blog posts, research, etc to https://www.jiscmail.ac.uk/cgi-bin/webadmin?A0=CROWDSOURCING – a central place to send new conference papers, project blog posts, questions, meet-ups. Crowdsourcing – asking the public to help with inherently rewarding tasks that contribute to a shared, significant goal or research interest related to cultural heritage collections or knowledge – is reasonably well established in the humanities and cultural heritage sector. The success of projects such as Transcribe Bentham, Old Weather and the Smithsonian Transcription Center in processing content and engaging participants, and the subsequent development of crowdsourcing platforms that make launching a project easier, have increased interest in this area. While emerging best practices have been documented in a growing body of scholarship, including a recent report from the Crowd Consortium for Libraries and Archives symposium, this workshop looks to the next 5 – 10 years of crowdsourcing in the humanities, the sciences and in cultural heritage. The workshop will gather international experts and senior project staff to document the lessons to be learnt from projects to date and to discuss issues we expect to be important in the future. The workshop is organised by Mia Ridge (British Library), Meghan Ferriter (Smithsonian Transcription Centre), Christy Henshaw (Wellcome Library) and Ben Brumfield (FromThePage). 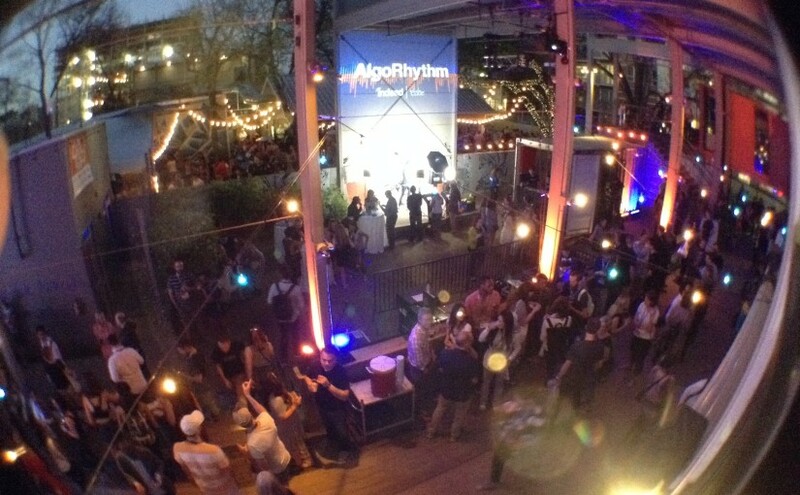 If you’re new to crowdsourcing, here’s a reading list created for another event. This week I was in Luxembourg for a workshop on Network Visualisation in the Cultural Heritage Sector, organised by Marten Düring and held on the Belval campus of the University of Luxembourg. In this workshop we want to explore how network visualisations and infrastructures will change the research and outreach activities of cultural heritage professionals and historians. Among the questions we seek to discuss during the workshop are for example: How do users benefit from graphs and their visualisation? Which skills do we expect from our users? What can we teach them? Are SNA [social network analysis] theories and methods relevant for public-facing applications? How do graph-based applications shape a user’s perception of the documents/objects which constitute the data? How can applications benefit from user engagement? How can applications expand and tap into other resources? A rough version of my talk notes is below. The original slides are also online. While I may show examples of individual network visualisations, this talk isn’t a critique of them in particular. There’s lots of good practice around, and these lessons probably aren’t needed for people in the room. Fundamentally, I think network visualisations can be useful for research, but to make them more effective tools for outreach, some challenges should be addressed. I’m a Digital Curator at the British Library, mostly working with pre-1900 collections of manuscripts, printed material, maps, etc. Part of my job is to help people get access to our digital collections. Visualisations are a great way to firstly help people get a sense of what’s available, and then to understand the collections in more depth. I’ve been teaching versions of an ‘information visualisation 101’ course at the BL and digital humanities workshops since 2013. Much of what I’m saying now is based on comments and feedback I get when presenting network visualisations to academics, cultural heritage staff (who should be a key audience for social network analyses). 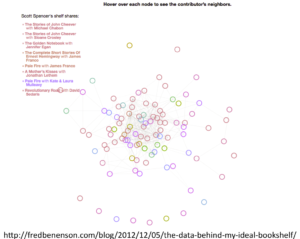 Provocation: digital humanists love network visualisations, but ordinary people say, ‘so what’? And this is a problem. We’re not conveying what we’re hoping to convey. When teaching datavis, I give people time to explore examples like this, then ask questions like ‘Can you tell what is being measured or described? What do the relationships mean?’. 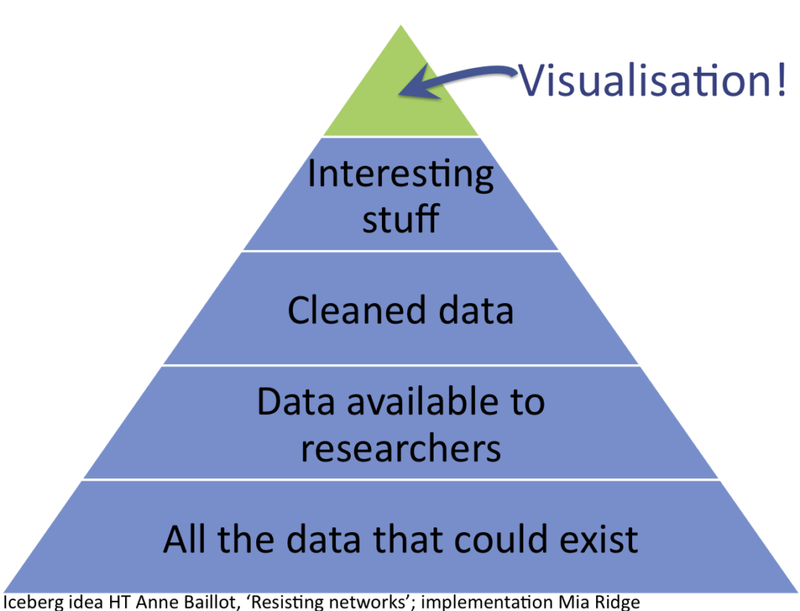 After talking about the pros and cons of network visualisations, discussion often reaches a ‘yes, but so what?’ moment. Spatial layout based on the pragmatic aspects of fitting something on the screen using physics, rules of attraction and repulsion doesn’t match what people expect to see. It’s really hard for some to let go of the idea that spatial layout has meaning. The idea that location on a page has meaning of some kind is very deeply linked to their sense of what a visualisation is. Animated physics is … pointless? People sometimes like the sproinginess when a network visualisation resettles after a node has been dragged, but waiting for the animation to finish can also be slow and irritating. Does it convey meaning? If not, why is it there? Size, weight, colour = meaning? The relationship between size, colour, weight isn’t always intuitive – people assume meaning where there might be none. 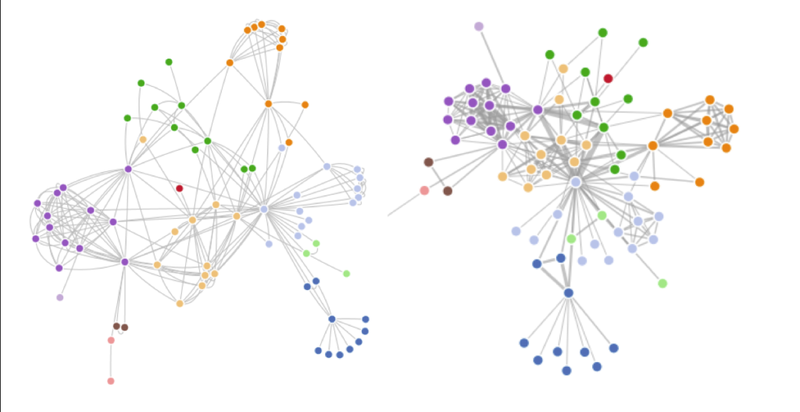 In general, network visualisations are more abstract than people expect a visualisation to be. 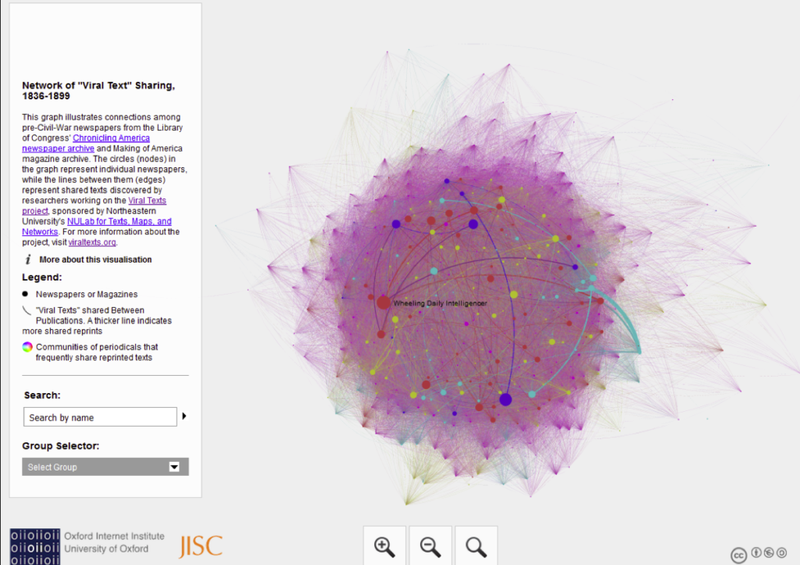 Scroll down the page that contains the network graph above and you get other visualisations. Sometimes they’re much more positively received, particularly people feel they learn more from them than from the network visualisation. Which algorithmic choices are significant? It’s hard for novices to know which algorithmic and data-cleaning choices are significant, and which have a more superficial impact. Images travel extremely well on social media. When they do so, they often leave information behind and end up floating in space. Who created this, and why? What world view does it represent? What source material underlies it, how was it manipulated to produce the image? Can I trust it? When I showed this to a class recently, one participant was frustrated that they couldn’t ‘see the wood for the trees’. The visualisations gives a general impression of density, but it’s not easy to dive deeper into detail. This flattening of time into one simultaneous moment is more vital for historical networks than for literary ones, but even so, you might want to compare relationships between sections of a literary work. All network visualisations look similar, whether they’re about historical texts or cans of baked beans. Dots and lines mask texture, and don’t always hint at the depth of information they represent. Node. Edge. Graph. Directed, undirected. Betweenness. Closeness. Eccentricity. 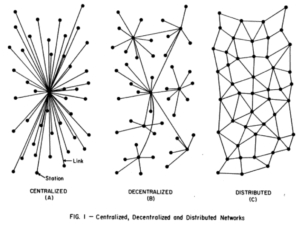 There’s a lot to take on to really understand what’s being expressed in a network graph. People find the interactive movement, the ability to zoom and highlight links engaging, even if they have no idea what’s being expressed. In class, people started to come up with questions about the data as I told them more about what was represented. That moment of curiosity is an opportunity if they can dive in and start to explore what’s going on, what do the relationships mean? For some, there’s that frustration expressed earlier they ‘can’t get to see a particular tree’ in the dense woods of a network visualisation. People often want to get to the detail of an instance of a relationship – the lines of text, images of the original document – from a graph. This mightn’t be how network visualisations are used in research, but it’s something to consider for public-facing visualisations. How can we connect abstract lines or dots to detail, or provide more information about what the relationship means, show the quantification expressed as people highlight or filter parts of a graph? A harder, but more interesting task is hinting at the texture or detail of those relationships. One of the workshop questions was ‘Are social network analysis theories and methods relevant for public-facing applications?’ – and maybe the answer is a qualified yes. As a working tool, they’re great for generating hypotheses, but they need a lot more care before exposing them to the public. But first – who are your ‘users’? During this workshop, at different points we may be talking about different ‘users’ – it’s useful to scope who we mean at any given point. In this presentation, I was talking about end users who encounter visualisations, not scholars who may be organising and visualising networks for analysis. Sometimes a network visualisation isn’t the answer … even if it was part of the question. As an outcome of an exploratory process, network visualisations are not necessarily the best way to present the final product. Be disciplined – make yourself justify the choice to use network visualisations. Include an extended caption – data source, tools and algorithms used. Provide a link to find out more – why this data, this form? What was interesting but not easily visualised? Let people download the dataset to explore themselves? Lots of interesting data doesn’t make it into a visualisation. Talking about what isn’t included and why it was left out is important context. Help users learn the skills and knowledge they need to interpret network visualisations in context. I’ve just spent two weeks in Texas, enjoying the wonderful hospitality and probing questions after giving various talks at universities in Houston and Austin before heading to SXSW. 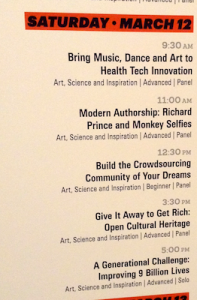 I was there for a panel on ‘Build the Crowdsourcing Community of Your Dreams’ (link to our slides and collected resources) with Ben Brumfield, Siobhan Leachman, and Meghan Ferriter. Siobhan, a ‘super-volunteer’ in more ways than one, posted her talk notes on ‘How cultural institutions encouraged me to participate in crowdsourcing & the factors I consider before donating my time‘. In other news, we (me, Ben, Meghan and Christy Henshaw from the Wellcome Library) have had a workshop accepted for the Digital Humanities 2016 conference, to be held in Kraków in July. We’re looking for people with different kinds of expertise for our DH2016 Expert Workshop: Beyond The Basics: What Next For Crowdsourcing?. You can apply via this form. One of the questions at our SXSW panel was about crowdsourcing in teaching, which reminded me of this recent post on ‘The War Department in the Classroom‘ in which Zayna Bizri ‘describes her approach to using the Papers of the War Department in the classroom and offers suggestions for those who wish to do the same’. In related news, the PWD project is now five years old! 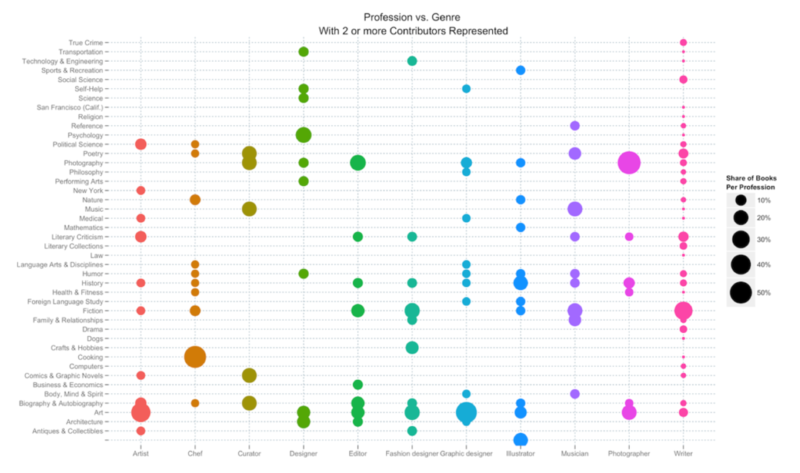 There’s also this post on Primary School Zooniverse Volunteers. The Science Gossip project is one year old, and they’re asking their contributors to decide which periodicals they’ll work on next and to start new discussions about the documents and images they find interesting. The History Harvest project have released their Handbook (PDF). 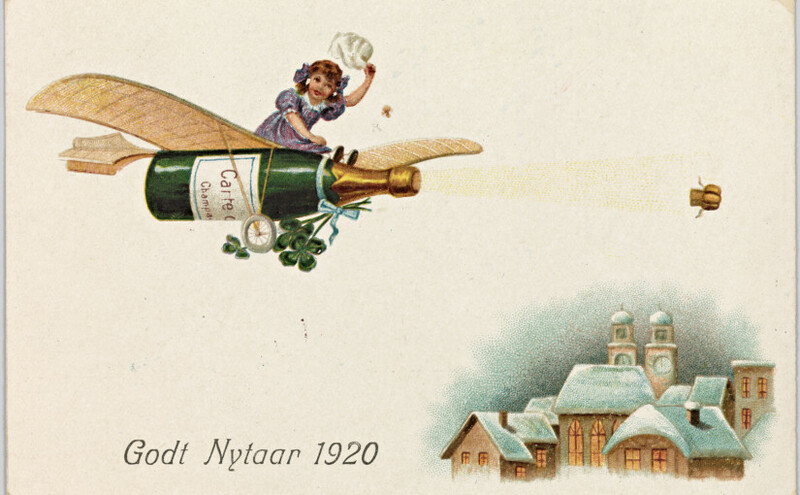 The Danish Nationalmuseet is having a ‘Crowdsource4dk‘ crowdsourcing event on April 9. You can also transcribe Churchill’s WWII daily appointments, 1939 – 1945 or take part in Old Weather: Whaling (and there’s a great Hyperallergic post with lots of images about the whaling log books). I’ve seen a few interesting studentships and jobs posted lately, hinting at research and projects to come. There’s a funded PhD in HCI and online civic engagement and a (now closed) studentship on Co-creating Citizen Science for Innovation. And in old news, this 1996 post on FamilySearch’s collaborative indexing is a good reminder that very little is entirely new in crowdsourcing. Apparently you can finish a thesis but you can’t stop scanning for articles and blog posts on your topic. Sharing them here is a good way to shake the ‘I should be doing something with this’ feeling. * This is a fairly random sample of recent material, but if people find it useful I can go back and pull out other things I’ve collected. Victoria Van Hyning, ‘What’s up with those grey dots?’ you ask – brief blog post on using software rather than manual processes to review multiple text transcriptions, and on the interface challenges that brings. Melissa Terras, ‘Crowdsourcing in the Digital Humanities‘ – pre-print PDF for a chapter in A New Companion to Digital Humanities. Richard Grayson, ‘A Life in the Trenches? The Use of Operation War Diary and Crowdsourcing Methods to Provide an Understanding of the British Army’s Day-to-Day Life on the Western Front‘ – a peer-reviewed article based on data created through Operation War Diary. 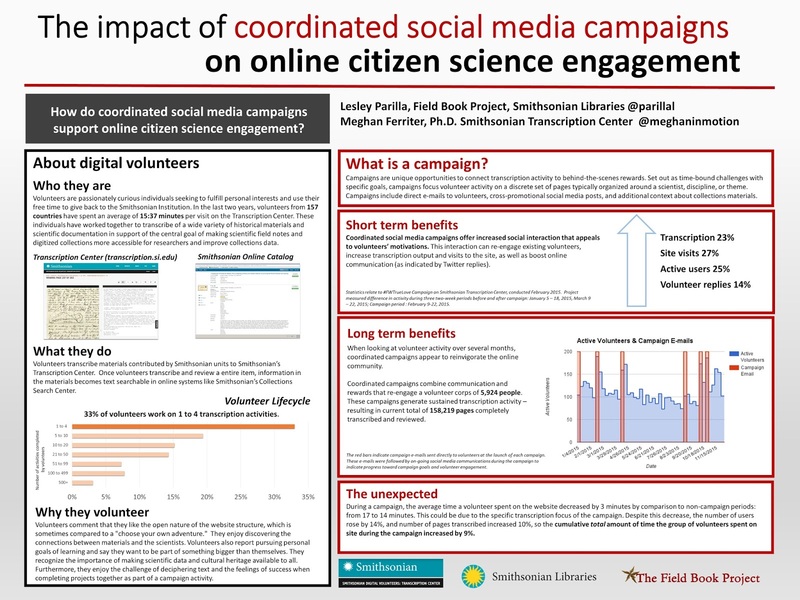 The Impact of Coordinated Social Media Campaigns on Online Citizen Science Engagement – a poster by Lesley Parilla and Meghan Ferriter reported on the Biodiversity Heritage Library blog. And finally, something related to my interest in participatory history commons – Martin Luther King Jr. Memorial Library – Central Library launches Memory Lab, a ‘DIY space where you can digitize your home movies, scan photographs and slides, and learn how to care for your physical and digital family heirlooms’. I was so excited when I about this project – it’s addressing such important issues. Jaime Mears is blogging about the project. * How long after a PhD does it take for that feeling to go? Asking for a friend. I was in London this week for the Linked Pasts event, where I presented on trends and practices for open data in cultural heritage. 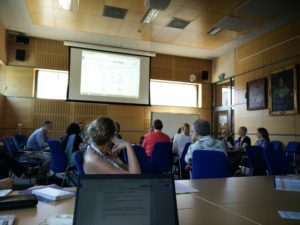 Linked Pasts was a colloquium on linked open data in cultural heritage organised by the Pelagios project (Leif Isaksen, Elton Barker and Rainer Simon with Pau de Soto). I really enjoyed the other papers, which included thoughtful, grounded approaches to structured data for historical periods, places and people, recognition of the importance of designing projects around audience needs (including user research), the relationship between digital tools and scholarly inquiry, visualisations as research tools, and the importance of good infrastructure for digital history. My talk notes are below the embedded slides. My discussion points are based on years of conversations with other cultural heritage technologists in museums, libraries, and archives, but inevitably I’ll have blind spots. For example, I’m focusing on the English-speaking world, which means I’m not discussing the great work that Dutch and Japanese organisations are doing. I’ve undoubtedly left out brilliant specific examples in the interests of focusing on broader trends. The point is to start conversations, to bring issues out into the open so we can collectively decide how to move forward. The good news is that more and more open cultural data is being published. Organisations have figured out that a) nothing bad is likely to happen and that b) they might get some kudos for releasing open data. Generally, organisations are publishing the data that they have to hand – this means it’s mostly collections data. This data is often as messy, incomplete and fuzzy as you’d expect from records created by many different people using many different systems over a hundred or more years. Copyright restrictions mean that images mightn’t be included. Furthermore, because it’s often collections data, it’s not necessarily rich in interpretative information. It’s metadata rather than data. It doesn’t capture the scholarly debates, the uncertain attributions, the biases in collecting… It certainly doesn’t capture the experience of viewing the original object. Licensing issues are still a concern. Until cultural organisations are rewarded by their funders for releasing open data, and funders free organisations from expectations for monetising data, there will be damaging uncertainty about the opportunity cost of open data. Non-commercial licenses are also an issue – organisations and scholars might feel exploited if others who have not contributed to the process of creating it can commercially publish their work. Finally, attribution is an important currency for organisations and scholars but most open licences aren’t designed with that in mind. 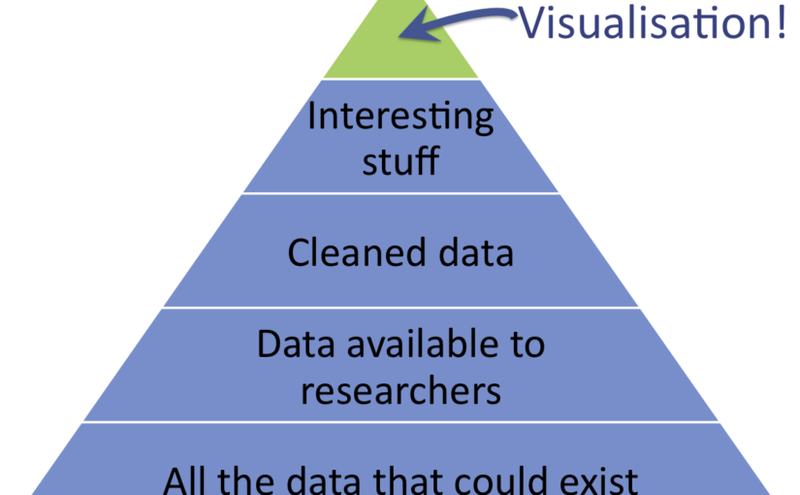 The data that’s released is often pretty unstructured. CSV files are very easy to use, so they help more people get access to information (assuming they can figure out GitHub), but a giant dump like this doesn’t provide stable URIs for each object. Records in data dumps rarely link to external identifiers like the Getty’s Thesaurus of Geographic Names, Art & Architecture Thesaurus (AAT) or Union List of Artist Names, or vernacular sources for place and people names such as Geonames or DBPedia. And that’s fair enough, because people using a CSV file probably don’t want all the hassle of dereferencing each URI to grab the place name so they can visualise data on a map (or whatever they’re doing with the data). But it also means that it’s hard for someone to reliably look for matching artists in their database, and link these records with data from other organisations. So it’s open, but it’s often not very linked. If we’re after a ‘digital ecosystem of online open materials’, this open data is only a baby step. But it’s often where cultural organisations finish their work. Cultural heritage technologists are often generalists, and apart from being too time-stretched to learn new technologies for the fun of it, they might not have the computational or information science skills necessary to implement the full linked data stack. Some cultural heritage technologists argue that they don’t know of any developers who can negotiate the complexities of SPARQL endpoints, so why publish it? The complexity is multiplied when complex data models are used with complex (or at least, unfamiliar) technologies. For some, SPARQL puts the ‘end’ in ‘endpoint’, and ‘RDF triples‘ can seem like an abstraction too far. In these circumstances, the instruction to provide linked open data as RDF is a barrier they won’t cross. But sometimes it feels as if some heritage technologists are unnecessarily allergic to complexity. Avoiding unnecessary complexity is useful, but progress can stall if they demand that everything remains simple enough for them to feel comfortable. Some technologists might benefit from working with people more used to thinking about structured data, such as cataloguers, registrars etc. Unfortunately, linked open data falls in the gap between the technical and the informatics silos that often exist in cultural organisations. And organisations are also not yet using triples or structured data provided by other organisations [with the exception of identifiers for e.g. people, places and specific vocabularies]. They’re publishing data in broadcast mode; it’s not yet a dialogue with other collections. In a way, this is the collections documentation version of the technical barriers. If the data doesn’t already exist, it’s hard to publish. If it needs work to pull it out of different departments, or different individuals, who’s going to resource that work? Similarly, collections staff are unlikely to have time to map their data to CIDOC-CRM unless there’s a compelling reason to do so. (And some of the examples given might use cultural heritage collections but are a better fit with the work of researchers outside the institution than the institution’s own work). This is an important point, and an area the community hasn’t paid enough attention to in the past. Too many conversations have jumped straight to discussion about the specific standards to use, and not enough have been about the benefits for heritage audiences, scholars and organisations. 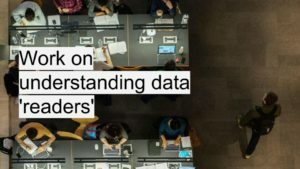 Many technologists – who are the ones making decisions about digital standards, alongside the collections people working on digitisation – are too far removed from the consumers of linked open data to see the benefits of it unless we show them real world needs. There’s a cost in producing data for others, so it needs to be linked to the mission and goals of an organisation. Organisations are not generally able to prioritise the potential, future audiences who might benefit from tools someone else creates with linked open data when they have so many immediate problems to solve first. While some cultural and historical organisations have done good work with linked open data, the purpose can sometimes seem rather academic. Linked data is not always explained so that the average, over-worked collections or digital team will that convinced by the benefits outweigh the financial and intellectual investment. You don’t often hear of people beating on the door of a museum, library or archive asking for linked open data, and most organisations are yet to map their data to specific, widely-used vocabularies because they need to use them in their own work. If technologists in the cultural sector are isolated from people working with collections data and/or research questions, then it’s hard for them to appreciate the value of linked data for research projects. The classical world has benefited from small communities of scholar-technologists – so they’re not only drinking their own champagne, they’re throwing parties. Smaller, more contained collections of sources and research questions helps create stronger connections and gives people a reason to link their sources. And as we’re learning throughout the day, community really helps motivate action. Getting linked open data into collections management systems should mean that publishing linked data is an automatic part of sharing data online. So it’s all a bit ‘chicken or the egg’ – will it stay that way? Until there’s a critical mass, probably. These conversations about linked open data in cultural heritage have been going around for years, but it also shows how far we’ve come.